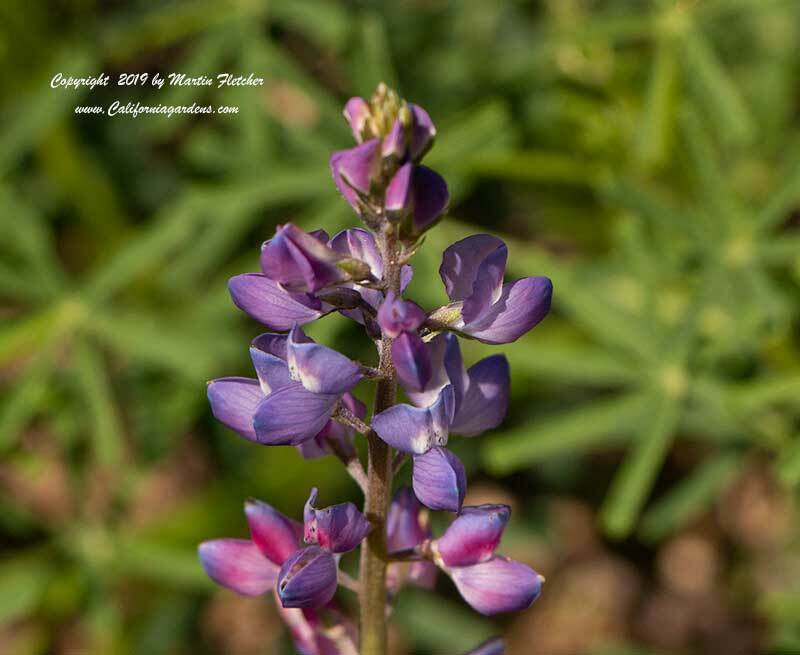 Lupinus truncatus is a small Lupine easily grown in the garden. The Collared Annual Lupine grows to a foot when conditions are good. Lupinus truncatus is noted for the truncated leaves. The flowers of Lupinus truncatus fade from blue to purple after they are pollinated. Lupinus truncatus grows through the coast ranges south of the Bay area into Baja. Fragrant flowers of Lupinus truncatus are produced from Winter into Spring. Wildflowers that require no supplimental water are a great way to expand the reach of the Drought Tolerant Garden. It is best to spread seed with the first significant rains in the Fall. Lupinus truncatus is a nectar source for the Orange Sulphur Butterfly and deserves a place in the butterfly garden. Fragrant blue flowers fade to purple after pollination Lupinus truncatus - Collared Annual Lupine. High resolution photos are part of our garden image collection.